I might as well admit this up front: weekly options are one of my favorite innovations in many years and VXX weeklys have become one of my preferred trades during the past few months. Why? Several factors are at play. Huge implied volatility is a plus, as is growing liquidity, the ability to employ VXX for speculative and/or hedging purposes, and the applicability of VIX-based ETPs as trading vehicles for the news cycle. The chart below shows the VXX weekly options that expire today and compares them to options on the standard monthly options expiration cycle, which still have one week left until expiration. Note that with three hours left in today’s trading session, the implied volatility (and skew) of the VXX options is distorted as we approach expiration. Whereas the options that expire next week have an implied volatility reading in the 77 – 125 range, today’s weekly options prices have IVs of over 700 on the call side and over 400 on the put side. While this may seem outrageous, given the fact that the VIX can spike without warning and the VIX futures and VXX will move sharply in conjunction with the cash/spot VIX, options prices (and thus IV) have to account for the possibility of a spike – particularly in light of the recent news cycle. 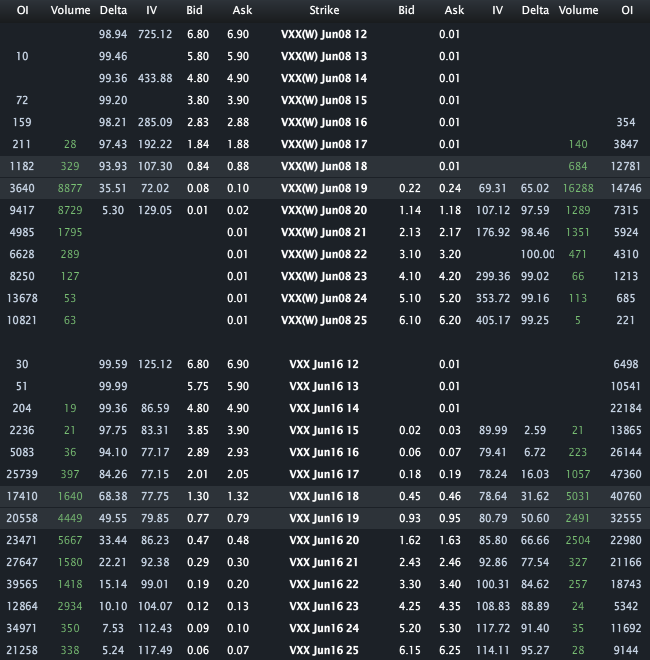 If you think VXX IV and options prices are crazy, then perhaps it’s time you considered trading the VXX weeklys. To reiterate what I hope is obvious to everyone who follows the VIX and the options market, VXX options are extremely aggressive trades and are probably best traded as spreads or in other defined risk positions rather than those which expose the trader to unlimited risk. More on this (these) subject(s) in the coming weeks.